If last Thursday’s storm had an upside, it was that we didn’t have to do any watering since that freakish tempest. In fact, the 40-minute downpour had a positive effect on all our plants, leaving one and all green and perky, even balky ones like our bougainvillea. We had casualties but they were few; one of them being the gorgeous echeveria above. Too tall and top-heavy, the wind took it out, breaking several long flower stalks in the process. I found it the next day and trimmed off the broken pieces; in a vase on our zinc kitchen table its color was an amazing complement. I couldn’t stop looking at this amazing fallen rosette and decided to document it in a photo still life. 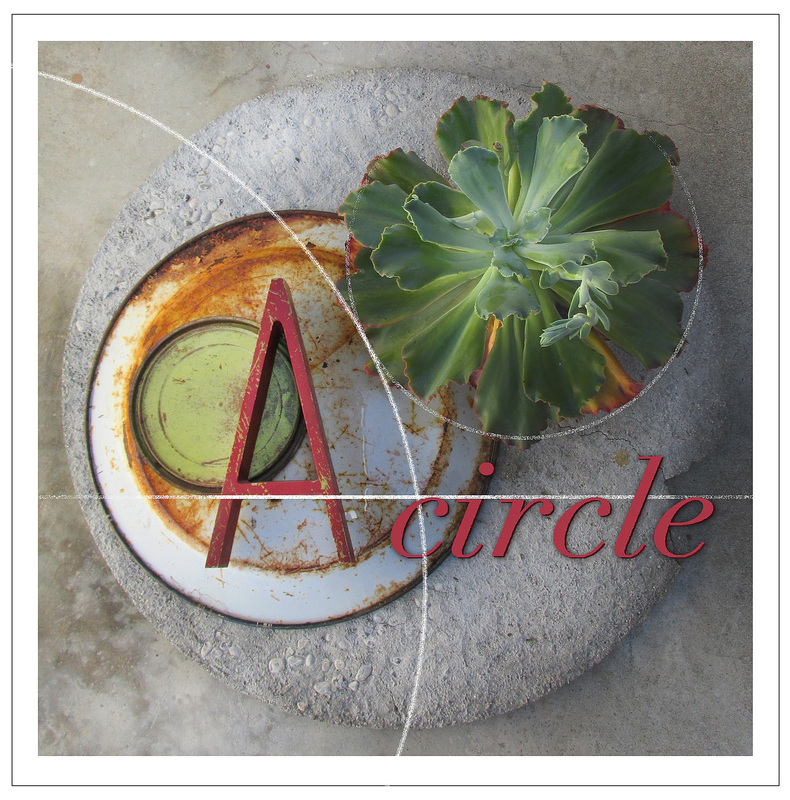 I began by collecting elements that I thought would play off the echeveria and its color or texture. That was when I noticed that I’d been separating the elements into groups based on basic geometric shapes … Never one to ignore a theme, I set up the photos accordingly, enhancing them finally with digital typography and chalk lines. 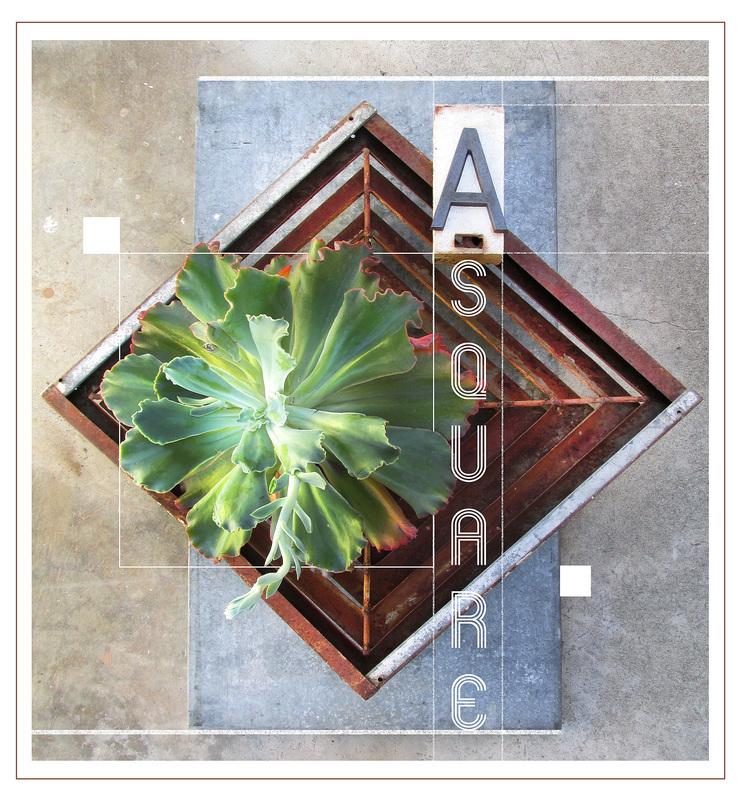 I’m pleased with these images, they make a storm-tossed succulent, random industrial junk and old sign letters look pretty good … and they were something I could put together in the shade once the sun went down. It’s crazy-hot outside! Oh my gosh… I am in love! I can’t stop looking at the different objects you used. I love the different A’s and the lines that you added. It makes me think something architectural. I can see these framed and hung in someone’s home, an art class or even as part of a calendar. Well done! And, I can only imagine how much fun you must have had when your juices started to flow. There’s nothing like that feeling when you’re on to something great! As usual, delights for the eye. We can, if we’re lucky, make eye pretty out of storm damage. Hey Reuben…..Love what you’ve done with Geometry. I only wish it would have been that easy and pretty in high school. Your eye for the artistry with plants is amazing. Thanks, Val … I hated geometry in high school and wish it would’ve been this fun, too!